Last week OrangeBoy was featured alongside companies such as Pepsi-Cola, Goodwill, GE and Sony when Microsoft released a customer success story showcasing Savannah ®. The article discusses the evolution of Savannah and its utilization of Microsoft Power BI Embedded to improve reporting, analytics, and visualization capabilities. In 2017, OrangeBoy deployed Microsoft Power BI Embedded to add advanced, but familiar and easy-to-use reporting and data visualization features to Savannah. The OrangeBoy development team was able to connect Power BI Embedded to its existing Azure SQL Database, eliminating the need to spend time, effort, and resources on building and maintaining its own visualization engine. Click here to read the article in its entirety and learn how Savannah community member, Oak Park Library has become a power user of Power BI Embedded. One of the advantages of living close to The Ohio State University are programs like “Science Sundays.” The College of Arts and Sciences offers monthly lectures on interesting topics like the Great Lakes, Neuroscience, and Bees. I attended the bee lecture on Sunday. The speaker talked about how bees, as well as wasps and ants, have been able to organize themselves, divide labor, and thrive as a species for more than 60 million years. The interesting part of the discussion is not the behaviors themselves, but how these insects know how to do these things. There are a few takeaways from the lecture that relates nicely to the human species even though we have time clocks scheduling software, project management tools and staff meetings to organize ourselves and get our work done. Noise is good – One of the things the researchers found in working with insects is that a little bit of tension is good when executing tasks. When there is a roadblock, they are able to address it and move on. It’s ok that everything does not always go perfectly. In fact, the outcome is better when they have to overcome some obstacle. Specialists vs. generalists – Insects have to be generalists when they are working solo. It isn’t until there are at least seven of them they can divide up the labor. Once they specialize, the system works best when handoff times are quick. Think of it this way. Let’s say you were part of a team, and someone didn’t complete their handoff. You have two choices. You can wait around for them, or go do it yourself. This is what bees do. Some will stay, and others will go back to being generalists. Use experience to your advantage – Ants take on easier tasks when they are first hatched, and get more dangerous jobs, like leaving the colony to get food, when they get more experience and approach the end of their life expectancy. Make your case and then shut up – Bees have an interesting decision-making process. When it’s time to select a new location for a hive, they send out a few scouts. They will come back, a few promoting Location A and a few promoting Location B, ‘dancing’ to make their case and recruit more scouts. After they finish dancing, they become silent and let the next recruits take over. The next round of scouts mimic the same behavior, dancing and then becoming silent. After a few days, the location with the most “buzz” (sorry, I couldn’t resist! ), is the location they choose. So, what are the big takeaways here. Well, first, we should embrace a little conflict in our work or personal lives. In other words, noise is good. If everything always went according to plan, we would never figure out how to improve processes or make new discoveries. Next, figure out where you can specialize and where you need a generalist approach. If specialization is not working well, perhaps there is a weak link in the process or a person somewhere along the line. Use experience to your advantage. Maybe this approach is intuitive with parents teaching their young, but are you leveraging experienced workers in the workplace? Finally, a little silence is golden. Make your case, try to get buy-in, and then let the process evolve. We’ve all been in committee meetings when Mary or Joe monopolized the conversation, even though they couldn’t win their argument but refused to let anyone else take a shot. Who knew bees and other insects were so interesting? I think I’ll make a “bee-line” to my library to check out a few more books on the topic. Half empty or half full? A classic example used in numerous articles and self-help books asks us to identify how we see the glass. 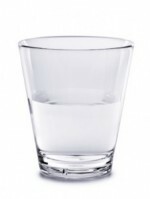 The thought is that if we see the glass half empty, we are pessimists. We have a client, Wadsworth Public Library, who chose to see their financial situation quite the opposite way. With their optimistic attitude and determination, they passed a levy that had failed just eight months earlier. You can also read a related article about the Wadsworth Public Library on the Library Journal blog, The Digital Shift. OrangeBoy provided the Wadsworth Public Library, located in Medina County, Ohio, analytics about its customers and community to pass a crucial operating levy. This time, armed with optimism, dedicated volunteers, and good data, it worked. Here’s how they did it. The library is anchored between the Akron and Cleveland metropolitan areas and it serves a community of approximately 25,000. The community had seen steady declines in state library funding since 2001, but it reached a critical point from 2008 through 2010, after sharp cuts to library funding due to the recession. This resulted in immediate budget reductions of $500,000 for the library (nearly 20 percent of its overall budget), and cumulative losses of $2 million over the previous 10 years. These cuts reduced operating hours, staff and programs. The library went to the voters in March 2012 and attempted to pass a 1.25 mill levy. Despite a valiant effort from community volunteers and the library, the levy did not pass. A ‘half-empty’ mind-set could have overcome the library and they might have just given up, cutting library services even further. But they didn’t. They decided to re-group and try a different approach. This time, they adjusted the desired levy to 1 mill, formed another dedicated volunteer committee, and hired OrangeBoy to understand the market dynamics at play. OrangeBoy helped the library with a comprehensive market analysis. Our study identified where their cardholders lived and displayed geographic trends visually with GIS maps, in addition to identifying other demographic characteristics of their customers and the overall market. We also incorporated voter registration information to add deeper insights about voting patterns in their community. After presenting our research, the library decided to play to its strength and focus its levy efforts on known supporters. They believed they would have a better chance at passing the levy if they could encourage loyal users to get to the polls. Their strategy worked, and the levy passed with 55 percent of the vote, a nine point swing from the election just eight months earlier. Our role in this effort is extremely rewarding, but it is their ‘half full’ optimism that inspires me. When I have a day that didn’t go as planned or am greeted with disappointing news, I remember the Wadsworth Public Library and look at that glass a whole new way. Here’s to an optimistic and rewarding new year. I just got a new laptop. My Dell was four years old, but the gray hairs were starting to show. I now have a new laptop that weighs 2 pounds and I love it. As part of this process, I transferred and archived old documents and files stored on my laptop, and came across a cartoon I clipped out of The New Yorker a few years ago (see photo below). It made me chuckle again as it did when I first saw it—a man presenting an elaborate chart asking the audience to let the information sink in. I think consultants do this to clients all the time—show charts and graphs depicting gobs of data, expecting clients to understand and the results to be crystal clear. Sometimes it is clear alright—clear as mud. My world as a consultant is all about interpreting data: Market trends, customer data, survey results, and demographics, among others. But what does it all mean and how do we help our clients interpret results into something meaningful? Pick one thing. Instead of showing multiple data points on a chart, pick the one thing that is most compelling and focus on that. Your presentation should tell a story. Choose the data points for each chart that help you tell that story. Edit. More is not better in all cases. Sure, we have all been guilty of building 100-slide decks, but I’m not proud of that. Get the scissors out and cut, cut, cut! Take time to digest the information. Sometimes a situation is complex and it takes some time to really think about what the data is telling you. Use images and words. Words are good, words with images are better. What’s the old saying? A picture is worth a 1,000 words. Narrate. Presentations are best delivered in person. Give your data added shelf life by providing speaker notes to your client to share with others. Better yet, provide an audio recording to accompany slides so others who were not in the presentation can have a similar experience. We have found the slideshare.net product to be a helpful tool. Explain it to your mother. I once saw a cancer researcher present his work. He said he always tried to explain his research as if he were talking to his mother. In other words, lose the jargon and simplify the message. I taped this cartoon to my desk. It’s a good reminder to remember my own advice. Good luck with your own data interpretation, and be sure to share your own tips with others below. 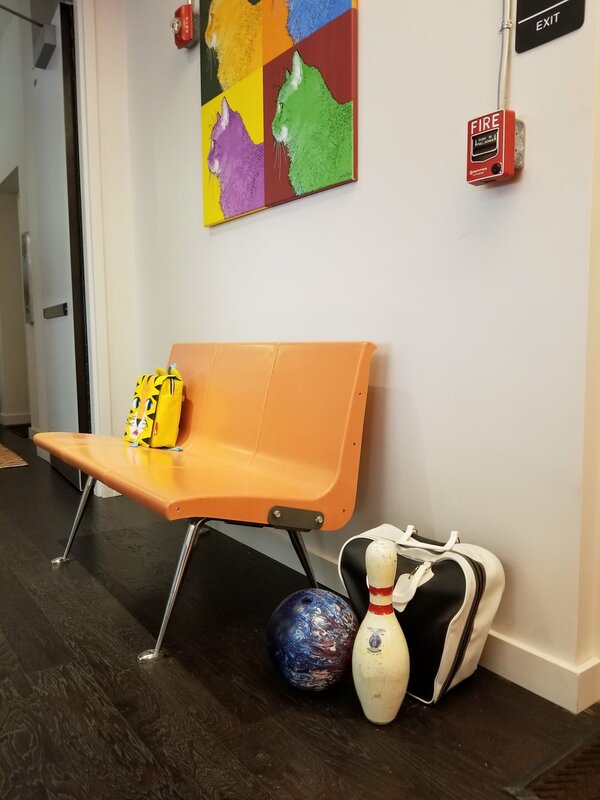 Why Do You Have a Bowling Ball in Your Office? It's not that we have a bowling ball, why wouldn't we? Rather, what does the bowling ball say about our work? Our first real gig as planners involved developing a new approach to senior programming at the Columbus Recreation and Parks Department. They awoke one day with the realization that as generations transitioned, so must their approach to senior programming. We did detailed analysis of the senior centers' membership, the most popular programs, reviewed financials, and conducted a product and service review with their staff planning teams. Several important recommendations came from this. First, they decided to focus more on inter-generational programs and activities. Second, they changed the names of their dedicated senior centers to Renaissance Centers. Finally, they cut many of their once-popular programs. As we reviewed the proposed programming cuts, event by event, each center director would shake his, or her, head. "Bowling," I said. Everyone nodded, except one person. "If we cut bowling, I'll have a rebellion. We fill every lane." I was confused. The individuals involved were all over 65. Most were drawing social security, so income differed little. Why was bowling so popular at this center? We mapped the members of that particular center with a first generation mapping software. They all clumped up around an old steel plant. Bingo. It took about three seconds to understand what happened. Those members had been former plant workers and had likely bowled in the industrial leagues. For me the lesson was clear: environment molds behavior, not demographics. The demographic analysis of the centers' membership showed few discernable differences. Yet when you look at the environment, huge differences resulted. It sometimes showed itself in subtle ways, but it existed nonetheless. I remember that lesson each time the bowling ball enters my sight. Our numbers represent a digital description of one's life. To understand their meaning, we have to understand the environment they grow from. The same holds true for our clients. If you want to understand them, go see them in their environment. It gives you an understanding of how they approach their work, and how we craft our services to assist them. I recently attended a breakfast seminar about customer experience sponsored by Chase Bank. The presenter, Joe Calloway, talked not only about customer experience in general but how to connect it with business growth. It was an interesting and thought-provoking way to start what would have been an ordinary Tuesday morning. One point that stuck with me is the nature of purchasing decisions today. Whether we are making a personal purchases or buying services on behalf of a company, we will seek out reviews, testimonials, and referrals to help make the right choice. Recognizing the importance of others’ opinions, it is essential to run our businesses and organizations based on what we want our clients and customers to say about us. To use a quote by marketing guru Seth Godin, “If your reviews aren’t stellar, do better work…” Makes sense. We did an exercise where we chose three attributes we would want people to say about us. It might be providing great value, delivering on time, or being responsive when dealing with questions. Based on the exercise, we were asked to answer this question, “What are the three things you have to get right every day?” For some reason, phrasing it this way helped me clarify what is important. Sure, we get busy with tasks, meetings, and a long list of to-dos, but focusing on those three things you HAVE to get right really helps cut through the clutter. When my days get busy and I need to prioritize my time, I remember these three things and it helps keep everything in perspective. I encourage you to come up with three things your business or organization needs to get right every day to bring a renewed sense of focus and clarity. The Net Promoter Score is a management tool that can be used to gauge the loyalty of customers relationships. In Savannah®, this survey is sent on a weekly basis to a random sample of recent customers to get immediate and continuous feedback, and responses are recorded and measurable within the business intelligence suite program. OrangeBoy earns distinction through demonstrated technology success and customer commitment. Read about our Microsoft Silver Cloud Platform Competency.